Animals have the right to live their lives free of exploitation founded on the principle that animals have the right to live their lives free of exploitation, abuse and harm inflicted upon them by society. We reach out to the public through demonstrations, letters to the editors, paid advertising, and personal appearances of our spokespersons on radio, television, and in school classrooms. We also promote animals' rights through meetings with, and letter-writing campaigns directed at, industry and community decision-makers. We publish a quarterly newsletter to keep our members informed about current campaigns and how they can become involved. Please get in touch with Animal Rights Foundation of Florida from the Contact box on the right. 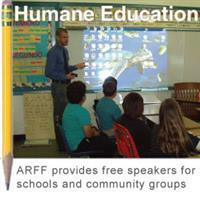 Your message will be sent to Animal Rights Foundation of Florida only. Privacy & Anti Spam protected.